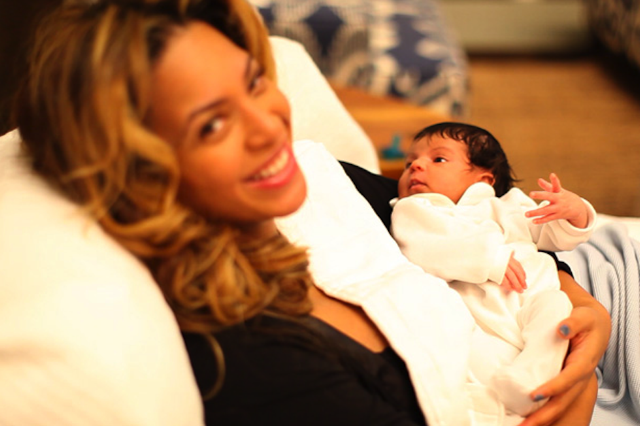 From pretty much the minute Beyoncé announced her pregnancy with a big ol’ belly rub onstage at MTV’s Video Music Awards in August 2011 to the moment she gave birth to Blue Ivy Carter in January 2012, the singer has been dogged by rumors that she wasn’t really carrying her own child. There was the collapsing baby bump. The suspicious behavior at the hospital. And the fact that she continued to look so damn Beyoncé when most pregnant women would look so damn Norbit. But in the latest issue of People magazine, where Mrs. Jay-Z is officially named Most Beautiful Woman, Beyoncé says she didn’t think the rumors were harmful. They were just freakin’ nuts. Now let’s all go look at cute photos of the most charmed baby in the Empire State and share some damn joy.